^ Sara’s mid-century home, tucked amongst the trees, in the Moyaone Reserve. 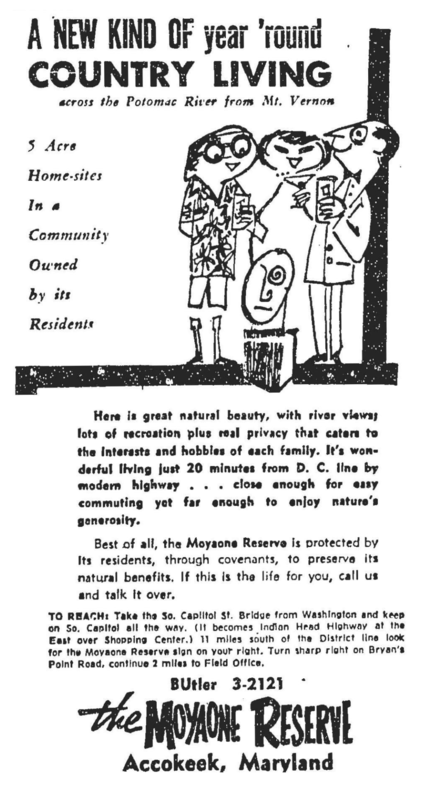 A 1959 advertisement for the neighborhood [justly] preens, Here is great natural beauty, with river views…. It’s wonderful living just 20 minutes from D.C. line by modern highway … close enough for easy commuting yet far enough to enjoy nature’s generosity. Best of all, the Moyaone Reserve is protected by its residents, through covenants, to preserve its natural benefits. Most of my neighbors in the Moyaone Reserve are passionately in love with this wooded community. One such person is my friend and neighbor Sara. While Jamie and I happened to stumble upon the area, find a house we liked, and move in within what seemed to be a matter of months, Sara “stalked” the neighborhood and its assorted mid-century homes for years until the right one became hers: a stunner designed and built in the 1970s by local architect Charles Wagner. ^ Sara’s favorite area of her home is the open living room and dining room. The high ceilings and open space allow light from the many windows to be appreciated anywhere in the house, and during the winter she can see the Potomac River from here. Since she moved in 14 months ago, this area has been in constant flux while she experiments to find the best furniture arrangement. ^ On the wall are two Leonard Baskin lithographs: Sitting Bull on the left, and Lieutenant Colonel Custer on the right. “I didn’t know of Baskin until last year, when an eBay search for Fritz Scholder led me to him. I like the raw lines of his drawings. Each drawing gave me an immediate emotional reaction. I found Sitting Bull first, then I found Custer. The pairing of the two, facing each other, makes a powerful statement, and it’s led to some interesting conversations.” The Italian pellet stove is an eBay find that replaced a stylistically out-of-place cast iron wood stove. The red sofa is vintage Knoll, and the wool rug is from Morocco, found on eBay. ^ A third Baskin lithograph, titled Betrayal, hangs on the opposite wall. The vertical wood beam in the center of the space isn’t original to the house, but at some point the previous owners installed it. Sara likes the way it helps to divide the space into three areas: the living room, dining room, and a sitting area. The Paul McCobb credenza and a mid-century sofa further define the living room area. ^ The vintage Danish teak wall unit has spent its entire life in the Moyaone Reserve. Before she purchased her house, Sara had her eye on a different home in the neighborhood. When the house itself didn’t work out, Sara contacted the owner about buying some furniture. The owner ended up giving Sara the wall unit, just happy that it was going to someone who would love it and care for it. “It had sat in place in that house for 50 years. It was dusty, but otherwise didn’t have a scratch on it.” The vintage Sansui tuner was a gift from a family friend. The black leather Selig lounge chair and ottoman were found on Craigslist. ^ On the vintage Jens Risom credenza are two pieces of ceramics that hold special meaning for Sara: a figure made by her late mother, on the left, and one made by Sara herself in high school. The painting on the wall beyond is by a woman named Laura whom Sara met during a Craigslist furniture purchase. ^ The original floor plans for the house, built in 1977. The house was one of the last designed by Charles Wagner in the Moyaone Reserve. The home’s previous (and original) owners left the plans for Sara. ^ The dining room opens into the kitchen, a work in progress. Sara removed the upper cabinets—”for short people like myself they were too impractical; I could never reach anything in the back—and they absorbed all the light!”—and plans to install wall panels with adjustable shelves from Kerf Designs of Seattle. Also on the horizon are fresh paint and hardware for the solid wood lower cabinets. In the meantime, Sara keeps the space lovely, even over patched drywall, with a reproduction of a vintage Cuban poster. ^ The panoramic view of the front yard from the breakfast area sold Sara on the house. While sitting here, just in the time we spent talking about her home, we saw a wild turkey, a deer, and a groundhog roaming the yard. Over the table is a CB2 pendant found on eBay. ^ The guest room is back in fighting shape after a large tree branch fell on this part of the house nearly a year ago. The 60-foot branch punctured the roof and came through the ceiling, but fortunately caused no serious structural problems, and broke no windows. The offending tree, still proudly standing, is visible through the window. In the corner is a Fritz Hansen chair. On the bed is a Kenneth Cole linen duvet. ^ Two views of the hall: Sara has such an extensive art collection (and such high ceilings) that some pieces are hung in unconventional spots, like above the door to a bathroom. Sara’s artwork was framed by Frame Savvy in Hyattsville, MD. Glass windows above the doorways gives even the hallway a sense of openness. ^ The colors in this painting, by Sara’s close friend Robert Lanzaro, are repeated in the dining room rug and the painting by the home’s entrance. Ooh, nice to be able to finally peek into another house in your ‘hood! Hope you can talk more of your neighbors into giving us a virtual house tour. I love the “southwestern” tile in the entry. Its also could be “french riviera”. Sara is so lucky to have such a beautiful home and has done such a great job decorating. Thanks for the tour. I always love getting a peak into other peoples homes, especially while hearing their story. I love the attention you gave to the history of the house and the art in it! I found myself curious about the history of native peoples on the land, and the reserve itself…how did this little oasis come to be? What did Charles Wagner have to say about it? And, it is a TOTAL STUNNER. She listened to the house and it spoke truth.